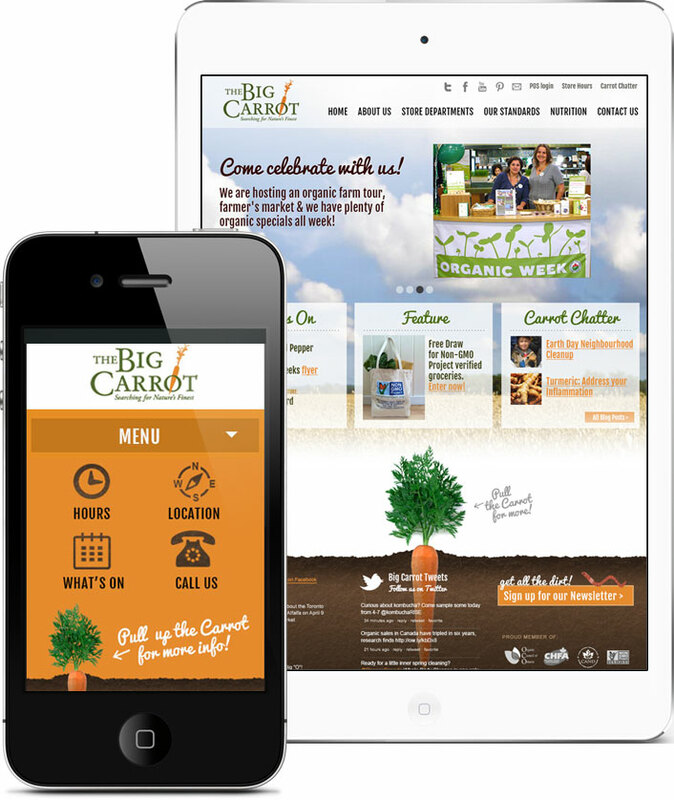 When we first met with The Big Carrot to redesign their website we connected right away – our Art Director Mark lives on a century farm and grows his own organic veggies alongside his chickens and other homesteading endeavors so we understand the importance of healthy, natural food. 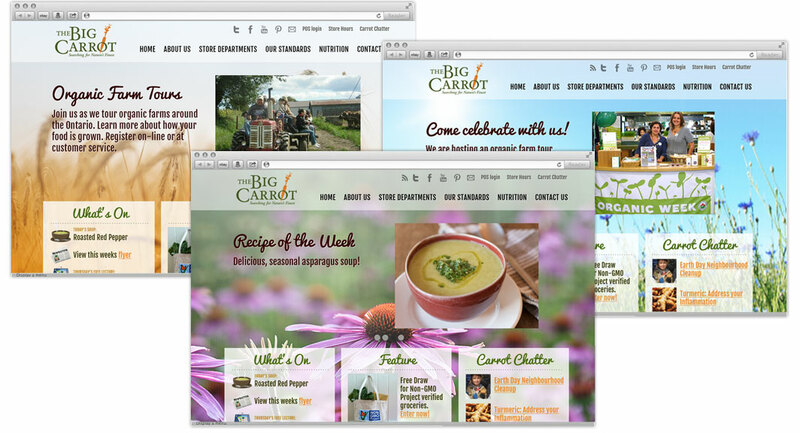 The Big Carrot’s old site was tired and used a clumsy content management system that was difficult to use and seemed to have a mind of it’s own. 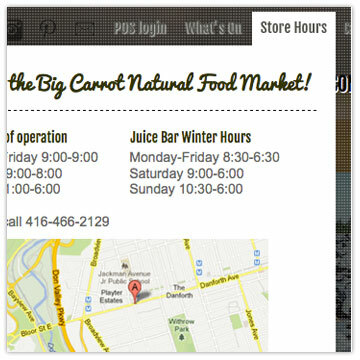 They wanted to introduce new features to their loyal supporters so we designed a new responsive site with desktop, tablet and phone versions of the layout, we built it on a modern content management tool that allows for easy updates (including changing the background photo seasonally), we added event calendars, integrated a Google street view of the interior of their store, photo galleries, new blogs and recipes. For key site sections we setup rich dropdowns to provide more information than plain text links. We designed the site to work well on all popular devices and know that their mobile users needed targeted information – not just a duplicate of the main site. So we gave them what they need in a simplified presentation for easy, direct access to the things that matter most. 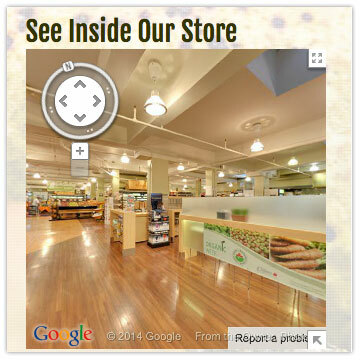 Additional site content is available simply by scrolling down or using the main site navigation. Brilliant! 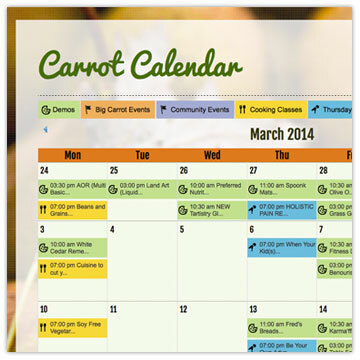 Users can subscribe to emails on the website and we enabled simple tools for the Big Carrot to connect with their tribe of followers. 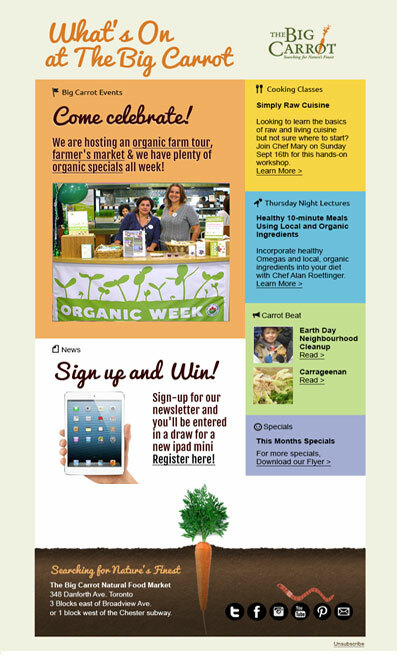 We designed a newsletter that reflects their brand and is consistent with the website visuals. It’s easy for them to update content to promote events, specials and contest to their followers. We’re also building a custom customer rewards points system that ties the website in with their points cards, ecommerce capabilities as well as other exciting new offerings to come!